Sandwiches seem like a simple thing, bread with stuff inside. I was excited to see there was a 'wichcraft in Vegas, the sandwich shop I became enamoured with in NYC. This time I got the goat cheese, avocado, celery, walnut pesto & watercress on multigrain bread. It was wonderful and as I was eating it all I could think was "why don't I make sandwiches like this?" I try to get creative with my sandwiches... an egg in our grilled cheese, avocado in our BLT... but I could do more. 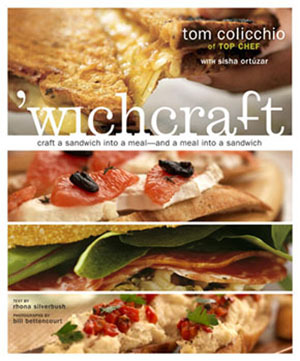 I think I will put the 'wichcraft book on my wish list. Time to kick our samwaches (as Aaron says) up a notch. My guy calls them "sammiches" which always makes me smile.